After having lunch at the Henderson Place Mall, we did some groceries shopping at the New Pacific Supermarket in the mall. We also checked out a Korean style dollar store there. I like to see unique household stuff that we do not find in our day to day store. On our way home, we drove pass a trail sign and we decided to stop and check it out. After all, our trip to this part of town is not wasted. 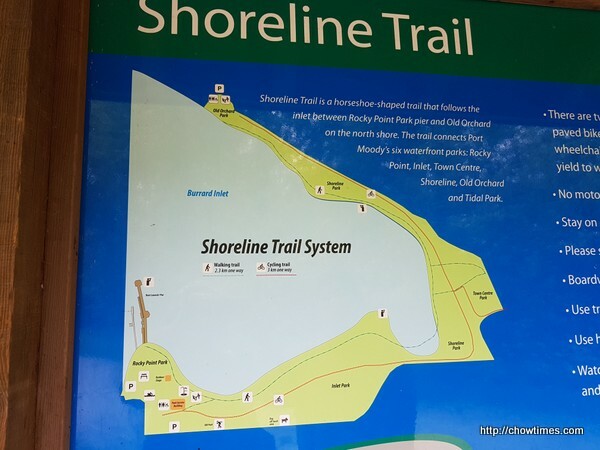 The Shoreline Trail in Port Moody follows the line of the original Ioco Road partway between Rocky Point Park and Old Orchard Park in the district of Pleasantside. Cake-Ya had been long on our list of places to visit. Actually, it was more on Suanne’s list because truthfully, I am indifferent to desserts and sweet stuff. This would have been a perfect place for her cake meet but since this place is over 1.5 hours drive from Richmond and back, that pretty much rules out this place for her cake meets. So who do you think she looks at to accompany her there? We would not have gone to this place recently if not because we had to drive Nanzaro to Port Coquitlam for his scholarship interview. Nanzaro is trying to snag a precious spot for a six week scholarship training in Ontario this summer. He seems confident he will get it and if he does and if we can figure out something for Arkensen, Suanne and I will have our summer vacation this year! The name of this place Suanne wanted to go to is called Cake-Ya. 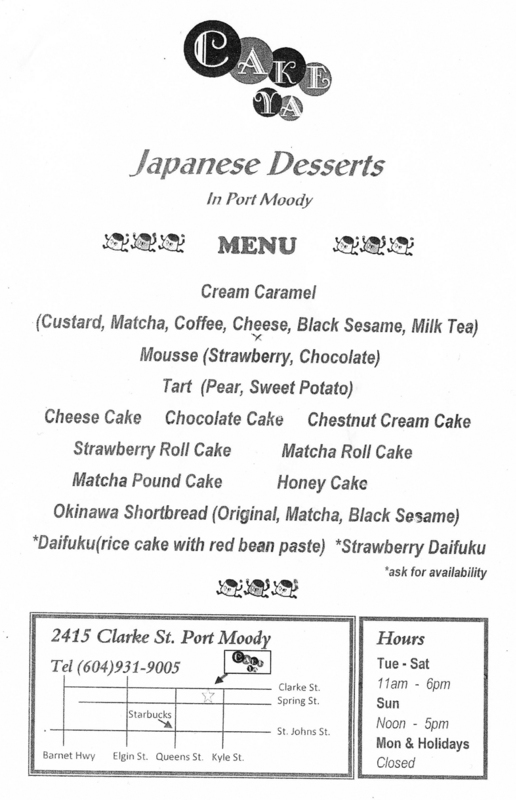 Simply put, this place can be sort of called Cake House … sort of because “ya” means house in Japanese. 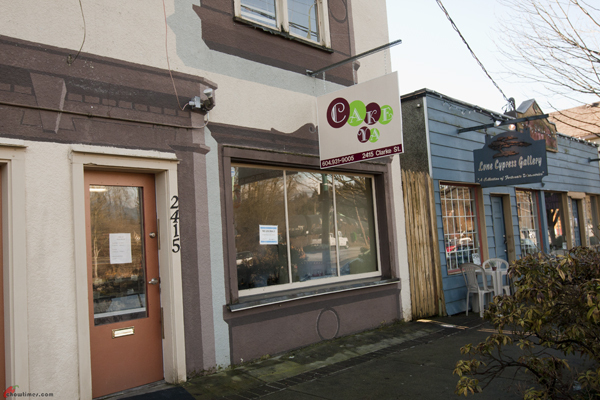 Jenny (My Secret Eden) was the one who alerted us to Cake Ya in this post on Kurumba in Port Moody. 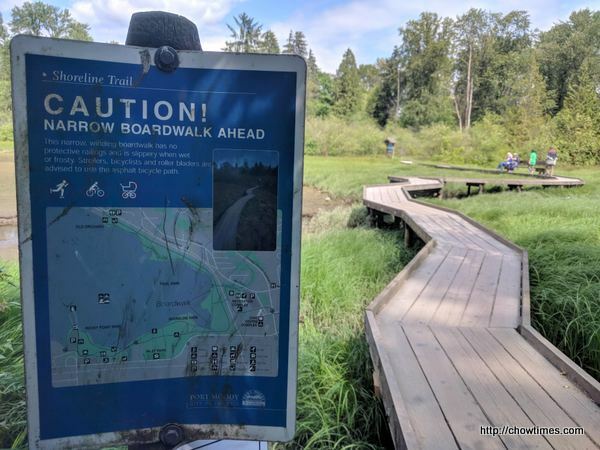 We would not have found it on our own not only because it is located in Port Moody, but it is on Clarke Street which is not a main route that many would take at all. Even when we had the address, we missed this place because the signage is so small. I thought this place would have been bigger but it’s just a small two person bakery type of operation with an open kitchen in full sight. The whole place is sparsely decorated with a small counter for retail sales. What they offer is simply all you see above. 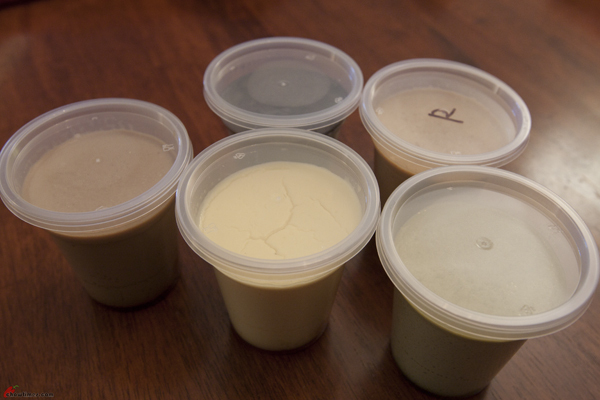 What they are famous for is the Cream Caramel and a few other cakes — all of them Japanese style. The two Japanese ladies who worked there were polite and friendly. They told us that they don’t really sell a lot of their food in the store but people do come here for them. Most of what they make is sold all over the city. When we told her that we are from Richmond, she told us we can get them from Izumiya … and for the same price too. The above is what they are famous for. In English they call this Caramel Cream. I don’t normally travel that far just to check out a restaurant as you know. There are a lot more places that we have never try before within 20 minutes drive from home. OK, maybe I would take a long drive if it is just Suanne and I. With the boys, it is not that easy. They will grumble and complain the moment we drive over the bridge … any bridge. As long as we keep within the boundary of the island that is Richmond, they are fine. Earlier this month, Mike wrote to us about this restaurant that he likes a lot. He was telling us about the owner chef who specializes on Sri Lankan food and named a few dishes that he had tried that sounded very interesting. This time, we did not tell the boys where we are going. They kept asking. I kept telling them it’s a secret. When they saw me driving along Stevestons Highway and then onto Highway 99, they knew it is not good. They knew it is not going to be anywhere in Richmond. Then I turned onto Highway 91 and that very instant both of them knew something is not right. We are going somewhere far far away. LOL! 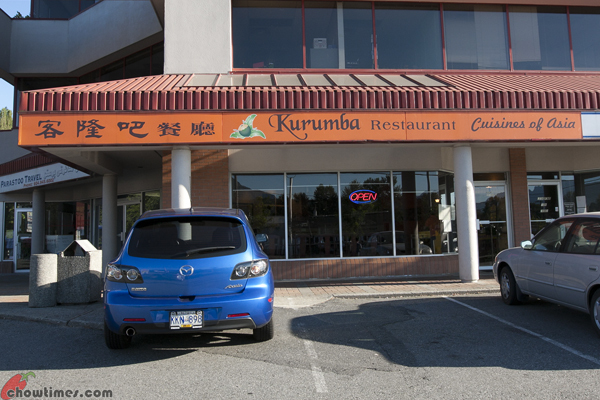 Kurumba is located on St Johns Street in Port Moody. 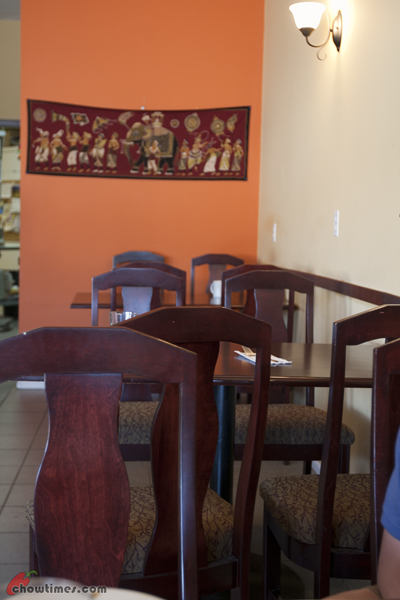 We had never blogged about any restaurant in Port Moody before. We even had to create a new “Vancouver Restaurants > Port Moody” category just for this post. 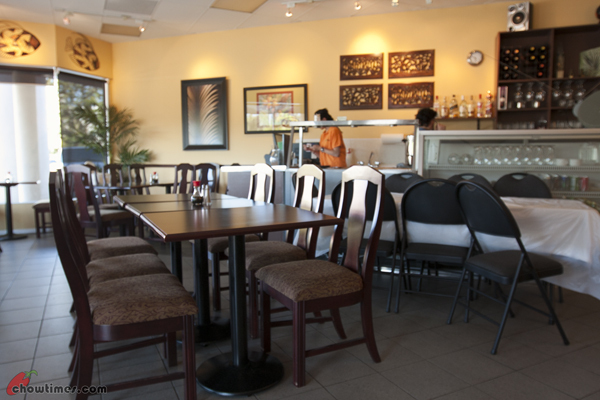 The inside of the restaurant is very clean and neat. It is an average sized restaurant — maybe seats 40 or so. We made reservation thinking that this restaurant might be very popular but it seems like reservation was totally unnecessary. At 5:30PM, we were the only customers. There was a table that had a reserved sign prearranged for 12 people though which I thought is a positive sign. Service was really good. They have three front staff who were really friendly and helpful. The more senior one, we initially mistook for the owner because she was boldly asking us about the camera and straight away asked if we were journalists. We said no and that we just like taking pictures of the food we eat. 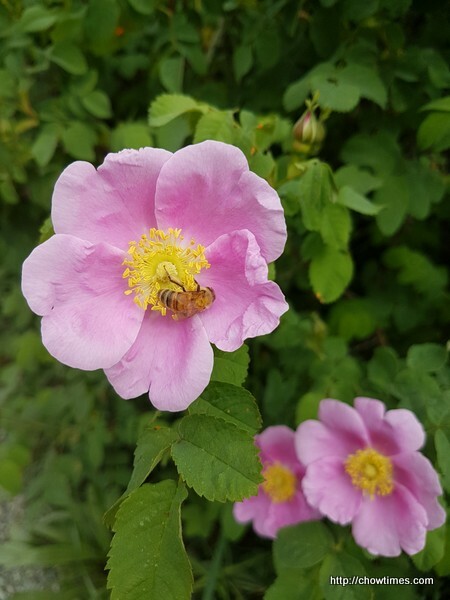 Often an employee will not ask so point blankly but an owner would. It turned out that the senior lady is just in charge of the dining area. I thought that for a restaurant this quiet, they are over staffed. We learned a few things. Since Mike said that this is a Sri Lankan restaurant, I assumed that the name Kurumba came from the name of the largest city in Sri Lanka, Colombo. Wrong. It is named after a kind of coconut common in Sri Lanka. This is going to be confusing, I know. I am kind of confused myself. 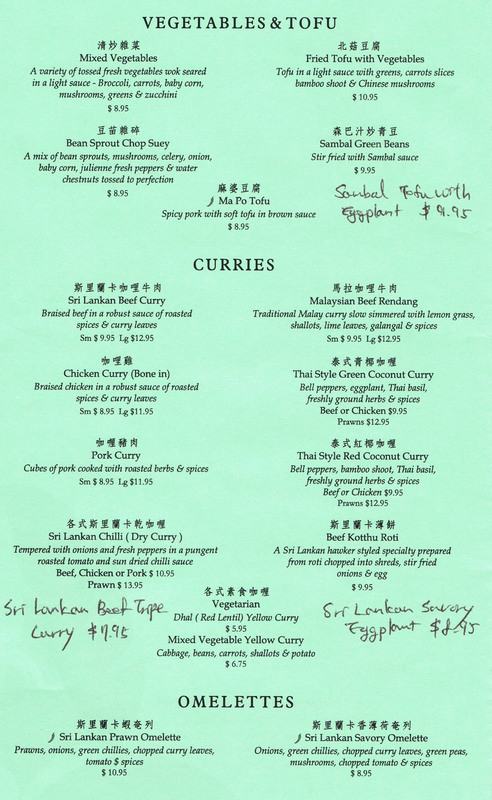 Mike says that this is a Sri Lankan restaurant and that the chef is Chinese who lived for a long time in Sri Lanka. When I asked the senior lady about the chef, she said that the chef was a Malaysian and the mum of the chef is from Indonesia. See what I mean when I say I am confused. It kind of figured because the signage outside the restaurant (see 1st picture above) says “Kurumba Restaurant — Cuisines of Asia”. The restaurant had been in operation for three years already and yet they are relatively unknown. There is no word of this restaurant on Urbanspoon but at least on Dinehere.ca there are quite a number of entries. Anyway, when you look for restaurant reviews what do you normally use? I mean aside from blogs. I find that I trust dinehere.ca more than Urbanspoon. Urbanspoon is too lop sided if you know what I mean. Yelp? I don’t even check them anymore. Both Urbanspoon and Yelp, I find, prey on reviewers vanity by giving them incentive to review more to get a higher rank. Anyway, I digressed. I find it kind of puzzling why this restaurant had flew under the radar for so long because the food here is more than decent. It was pretty good. When we read the menu, it made more sense. 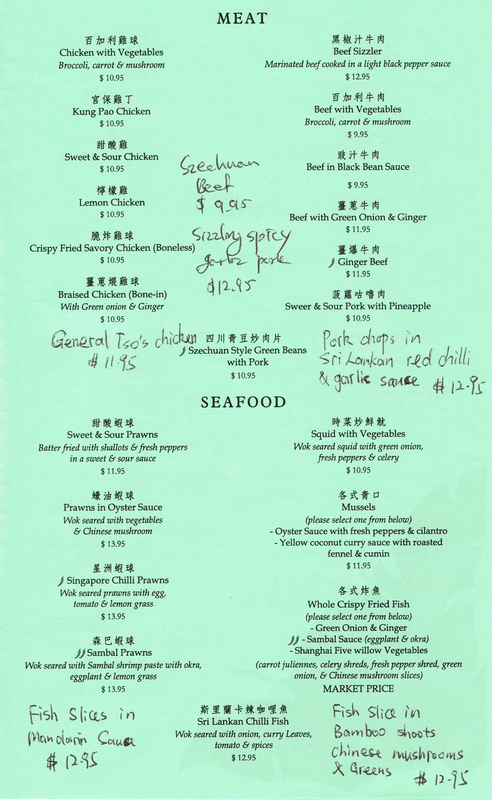 Most of the menu items are Sri Lankan and Malaysian dishes, albeit Chinese Malaysian dishes. 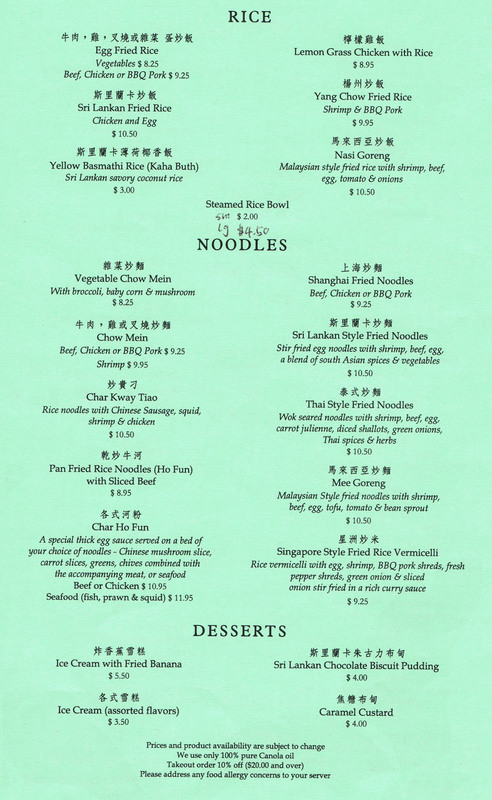 Then there is dishes with words like sambal, roti canai amidst other Chinese Malaysian dishes. 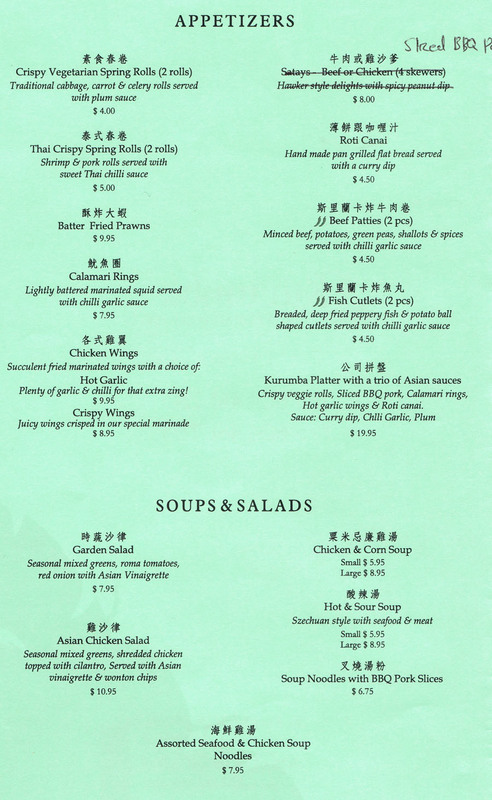 The menu speaks of spiciness in a lot of the dishes too. The thing is that they did not indicate if the dishes are spicy nor did they ask us how spicy we want it — just like in Asia, they don’t ask you. They will make it as spicy as it is meant to be. And oh boy … it is spicy. Both Suanne and I broke sweat eating here which is rare because we grew up eating chilli every day. 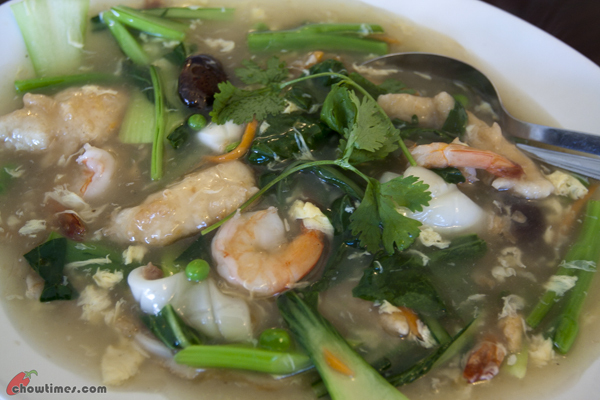 The Char Ho Fun is their most popular dish. Even Mike was telling us that he saw many people ordering the few times he was there. We ordered the seafood version which is $12. It is available with beef or chicken version which is a dollar cheaper. Fantastico … made just like the way we remember it in Malaysia. This is not spicy of course and is common to Chinese Malaysian. In KL this is popularly known as Cantonese Fried Noodles or Gong Fu Chow but this one has more sauce.